Karnataka, this state is in Southern part of India located in the Deccan plateau. This state have many cultural heritage and this reflects in their cuisine and foods. Obviously this state have a diversity and amazing food culture which is very much in variety.Karnataka cuisine is a mix of both vegetarian and non vegetarian cuisine,while pure vegetarian meal is popular in and around. People living in the coastal areas enjoy seafoods. The cuisine Udipi,Malenadu,Kodagu, Mangalorean and Navayath form the part of Karnataka cuisine. Rice is the staple food here, but rotis with wheat, jowar and ragi are consumed very much in northern parts of this state.Sesame and groundnut oil are common cooking oil in this state, eventhough people living in coastal area of Karnataka use coconut oil,some coastal Mangalorean cuisine is influenced by the Goan cuisine, thus they use coconut milk abundantly in their cuisine. Mangalorean cuisine are spicy in nature, pancakes, rice rotti,kori rotti,neer dosa,sannas are popular dish here while sandige, avalakki and talipittu are quite famous in Malenadu cuisine. Udupi cuisine is strictly vegetarian,onions and garlic are totaly avoided in this cuisine, one cant resist to their masala dosa and the sambar,rasam,pickles, drycurries are special delicacies of this cuisine. Kodagu cuisine is quite an opposite cuisine when compared to the other cuisines of Karnataka, its has so many non vegetarian delicacies like pork curry,chicken curry. While in North Karnataka, rottis prepared with wheat and jowar are quite popular, people of this part make varieties of rotis and they serve it with palya, usli etc.Desserts plays an important role in this cuisine, famous sweets like Mysorepak, chirotti,obbattu,payaa,poppyseeds payasa are very common in this cuisine. For my today's post, i chosed this crispy butter dosa from the city Davanagere in Karnataka. Benne dosa means butter dosa, this dosa is made with a dosa batter but with lots of butter. The side dishes served usually with this butter dosa is a special chutney with some whole spices and grated coconut alongwith potato masala, both tastes awesome with this crispy dosas and we loved it very much. Soak the urad dal, fenugreek seeds and rice for an hour. Wash rice flakes and keep aside. Grind the soaked dal-rice,washed rice flakes together as smooth batter. Add the rice flour,salt,grind again for few seconds. Keep aside for overnite or 4-5hours. Heat a tawa, spread a thin dosa, drop some butter pieces generously, cook until it turns crispy. Flip the dosa, fry for few seconds, fold. Serve with potato masala and chutney. Grind all the ingredients together with some water. Heat oil,let splutters the mustard seeds,now add the chopped onions,chopped ginger,curry leaves. Fry until the onions turns transculent. Add the turmeric,salt and potatoes,cook for few minutes. Mix well,put off the stove. The crunchy dosa looks delicious..like the chutney it is new to me, though I have read about the dosas. oh ur tempting me with this dosa .reminds me of my bangalore golden days ....nenage benne dosa bekku . Wow another one of my favorite dosas Priya..looks fantastic! These crispy Dosa with Aloo subzi wat else we want to relish our taste buds in the morning. Scrumptious breakfast. Looks so delicious and perfect.. great presentation too!! Crispy looking dosa. I love it! Benne dosa looks perfect. It's making me drool. Butter dosa ...wow. Send me one dear. Looks flavorful with all these sides. Benne dosa looks tasty and wonderful ! Healthy dosa luks tasty vth masala..nice pic. Looks so good ! Golden brown and crips. Wow! such a tempting dosa with neat presentation, hv to try soon!!! Yummy! 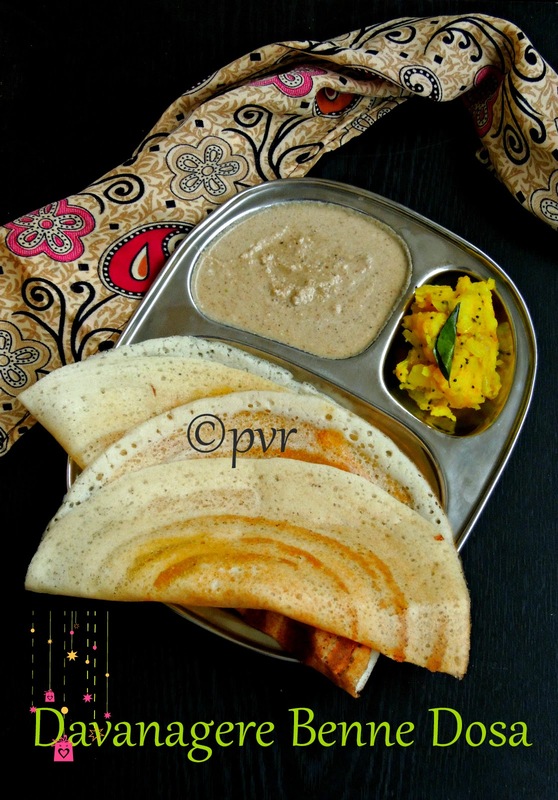 We love this dosa at home, lot of buttery goodness! That dosa looks so crispy and crunchy! The platter looks lovely. the crispy dosa is mouth-watering.. can never get bored of it.. the chutney sounds really different with cinnamon, cloves and cardamom.. So many dosas this time!! Love these buttery dosas! Yummy. My mouth's watering just thinking about this butter laden dosas. Yum yum! The plate is making my mouth water. The chutney is deliciously new so a must try. I was wondering how this dosa is different from the other dosas. So these are butter dosa! I am sure tastes great with generous amount of butter used to fry the dosa. Nice choice for the state. I was actually going to make this for karnataka breakfast but saw another new one and changed it. Have to make this soon.Looks yum! omg crunchy dosa witha very interesting chutney there looks fabulous :) awesome recipe choice aks chance ille kalakudhu ! !